The amazingly inexpensive postcard continues to be popular with Guerilla Marketers that realize the many ways in which this small-format marketing weapon can be used to generate new business. Most mail has to be opened to be read so people often look at just the envelope, decide they’re not interested, and out it goes. In contrast, a postcard is already “opened,” ready to read so the message will be seen – no matter how speedily – by the recipient. Postcards offer small size, visual impact and portability. Postcards range in size from 4” x 6” and 5” x 7” to oversize mailers up to 11” x 17”. The right size depends on how you are using it and the amount of information it has to carry. The beauty of the traditional 4” x 6” postcard is portability. It can fit in a shirt pocket or purse and is still large enough to mail and place in a traffic location. The limited size makes it hard to sell a product or service directly from the card so use it as a way to get attention and lead them to take a specific action – call for more information, visit your web site, etc. Match the marketing message to the audience you are talking to. 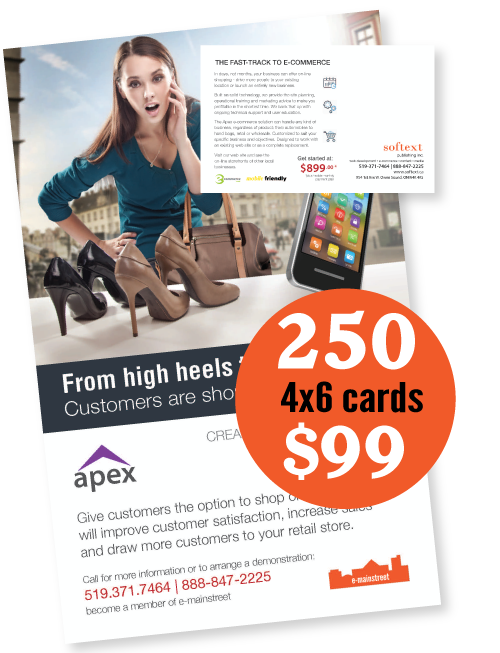 Postcards are inexpensive so you can afford to create multiple versions and offers specific to customer groups. Rather than include a “laundry list” or products and services, simplify the message to one or two items and a single offer or call to action. Make it memorable. A great-looking postcard will get more attention and will be remembered longer than one that is poorly designed. Write well. There is no space for long messages, boring copy and worst of all, text that contains typographic, spelling and grammar errors. Use the postcard to generate web site traffic. Be sure to include the web site domain name and make it interactive, include a QR-code that links directly to a page on your site that includes additional information related to the offer on the card. If the URL is too long, consider getting an alternate short name that you point to a specific section of your web site. Postcards are a versatile marketing tool and not only just something you throw in the mail. Insert a postcard into every customer purchase bag when they leave the store. Include a simple thank-you for doing business and a special offer on your next purchase to bring customers back. Display them where they can be seen and picked up by customers. Better yet, place them in other high-traffic locations such as a tourism kiosk or compatible business. Hand them out at trade shows and events. They’re not a lot bigger than a business card but can carry a lot more information. If you are a tradesperson, consider doing a mailbox drop with your postcards into neighborhoods that are the best prospects for product or service. A couple of kids wanting to make some pocket money can blanket several hundred addresses in a few hours. You can get them into mailboxes using Canada Post’s unaddressed mail service for about 18¢ card. This service allows you to target specific towns, regions and class (business or residential). Postcards are a Qwik Print specialty, offered in a variety of sizes in quantities of 100 to 10,000.